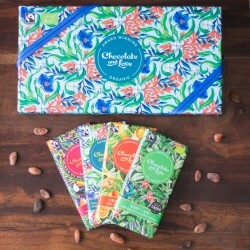 Chocolate and Love was founded by Richard and Birgitte O'Connor in 2010. 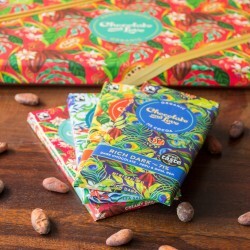 The couple left behind their corporate jobs and followed their passion for chocolate, setting out to create one of the best organic ethical chocolate brands in the world. 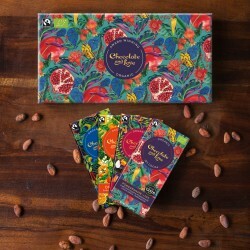 It is important to Chocolate and Love that every aspect of their business is run as ethically as possible. They use only certified organic ingredients to enable full traceability, and source their ingredients from cooperatives certified by Fairtrade. Many of these are made up of various small family farms, and the average size is just five hectares. 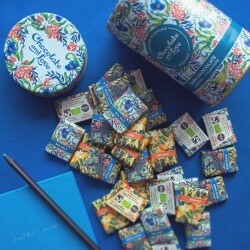 Chocolate and Love are thrilled to have won a very impressive 29 Great Taste Awards for their range so far, plus awards from the Academy of Chocolate for two of their flavours.